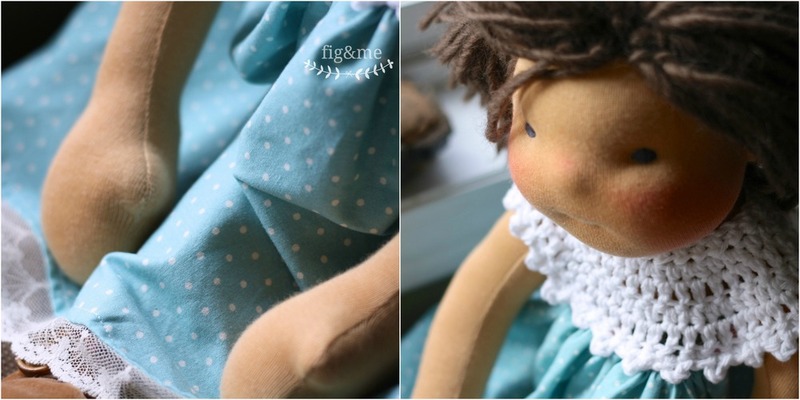 As I mentioned before, I am working on a small doll trousseau for Little Mina. Her wardrobe consists of four dresses with small flowers, blue, lace and lots of gathers. 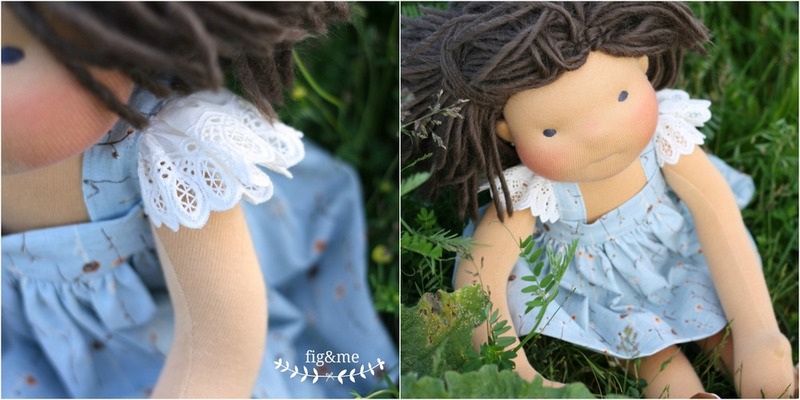 A long-puff-sleeve with elasticized wrists linen dress with a bit of lace on hem and yoke, inspired by the one made for Little Clara; a blue linen pinafore with flutter lace on the straps, inspired by the one I made for Miss Tatjana Buttonloop; a crochet-yoke dress, with white polka dots on blue, inspired by the one I made for Miss Anne Sophie, which in turn was inspired by the one I made for my parisian princess; and a long, oversized-floral print linen dress with furry neckline, inspired by the one made for Red Scarlet. Now, since the fancy velvet ribbon with rabbit fur I used for Scarlet's dress is long gone, I have to figure out how to add a bit of fluffy goodness to Mina's new dress. And, I also have to appease Enid who is starting to feel quite neglected in the wardrobe department...modelling all those dresses for her sister and all. But, I keep telling her she just needs to have a chat with Mina and arrange some sort of lending program. Off to figure out how to add fur to a neckline without messing up the already finished dress. Wish me luck!